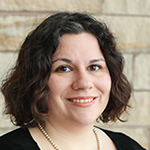 Rebecca Mattson is the Head of Faculty and Research Services at Penn State Law. In this capacity, Mattson provides leadership within Law Library in planning and implementing enhanced scholarly support as well as faculty research and teaching support programs, manages the Penn State Law eLibrary, provides reference services, and teaches a section of the 1L Legal Research course. She received her MLS from the University at Buffalo and her JD from the University at Buffalo School of Law.